My parents moved in yesterday. All of my siblings along with Ben and my brother-in-law helped with the move. It was accomplished with minimal fuss and finished shortly before 3pm. With the move, I've had to change my email address because my email address was connected to their Road Runner account. Talk about headaches! I needed to then change many, many accounts that are connected to that address. The biggest headache has been Google. I had a gmail account from a while back. I wanted to somehow combine the Reader with my gmail account. No dice. I can get a new gmail address that's connected to my current email account which is where all my other Google stuff is. I didn't want that since that email address will no longer be valid. Following? I finally figured out how to copy all the subscriptions over to my gmail account, but have not figured out how to write the code for the Google Reader Share widget to connect it to my newer gmail account based Reader account. Got that? I was also following a few people so I could see what they liked. Well, I can't find everyone yet. And, if you're following me, you'll have to find me again. Sigh. It's not that big a deal. It just gives me a headache because I'm just not as technically savvy as I'd like. If you need me to send you my new email address, please leave me a comment. Oh, and I'm going to get ride of almost all my sidebar stuff. People tell me they're having trouble loading my page to leave comments. My parents are moving in with us in a couple of months. It's going to be fine if a bit of a squeeze. Not because we don't have a lot of rooms available but because, well, I'm a hoarder serious pack rat. This weekend Ben moved our bed from the master suite into the playroom which is now officially our room. 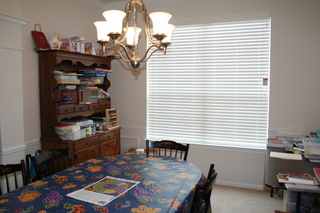 The master suite is the staging area for organizing the rest of the house. 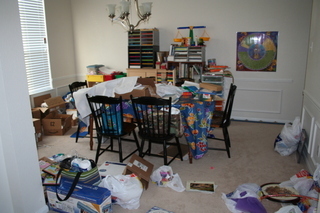 We have the stuff from my study which is now Sister's room plus ALL my crafting stuff. Today, I'm finishing pulling everything out of Sister's room. There's so much dust everywhere my sinuses are going crazy. Sigh. It will be done and Sister can really have her own room to organize as she pleases which, unfortunately, is a lot like me...haphazard. I LOVE reading from a book, but I also love more having a book in e-format because it doesn't take up much shelf space. That alone makes me want to get a Nook or Kindle for each of my children. It won't do much to help alleviate the mess 1000s of books we already own can cause though. I'll keep you posted on our progress. Our house is very much in need of organization. My dear friend, Cecelia, is itching to get to work on helping me toss. I'm not quite ready yet. As part of my Lenten journey, I am cleaning and organizing my entire house with the intention that the whole house will be completed by Easter. I started in the schoolroom. And, here are the after shots. 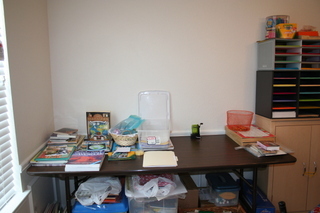 This table holds our monthly read aloud books from various lists. There's quite a bit of wall space there that I need to fill up. I think I'll hang the dry erase board I've had sitting around. Finally, tomorrow, we will have school in the schoolroom. We're all very excited. 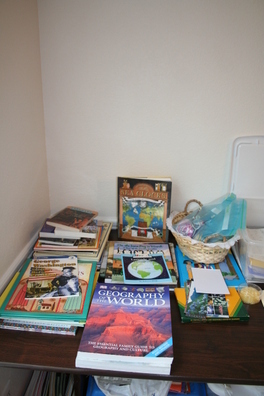 I still need one more big bookshelf to put books and some Montessori materials, but that will have to wait. 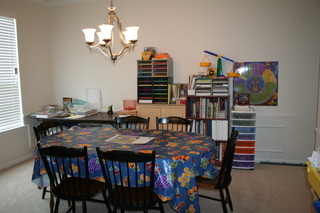 I will also be placing our little table/bench set by the window for my two younger ones to do "school".